TV animation with their Hanna-Barbera Studio. And the greatest of their early successes was The Flintstones. If a modern stone-age family could make it big, why not a retro future one? And that's why we met George Jetson, as the song goes, as well as the rest of his family. Another way The Flintstones paved the way for The Jetsons was by premiering on prime-time TV, thus sparking the first prime-time animation fad. George et al. premiered on ABC's prime-time schedule in 1962. Once the fad had run its course, however, they were relegated to Saturday morning, where the same 24 episodes were re-run over and over. A third similarity between the two is that both took their basic set-up from pre-existing series, changing only the setting. The Flintstones was The Honeymooners in the Stone Age, whereas The Jetsons was Blondie in the future — even to the point of Penny Singleton, who played Blondie in films and on TV, providing the voice of Jane Jetson. Other voices were George O'Hanlon (better known as a face actor than a voice actor) as George, Janet Waldo (Penelope Pitstop, Morticia Addams) as daughter Judy, Daws Butler (Huckleberry Hound, Peter Potamus) as son Elroy, and Don Messick (Scooby-Doo, Atom Ant) as the dog, Astro. The Jetsons fared better in comic books than on TV, being published on a regular basis from 1963-73, and sporadically ever since. Their publishers include Gold Key, Charlton, Harvey and Archie. In the 1980s, the series enjoyed a resurgence in popularity, and new episodes were made to supplement those that had been in syndication for the past couple of decades. 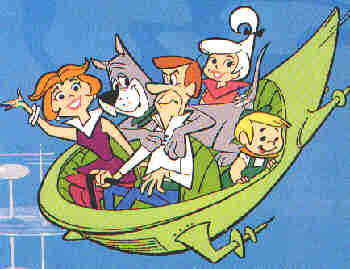 The family even met their spiritual ancestors, Fred and Wilma, in a two-hour 1987 made-for-TV movie, The Jetsons Meet the Flintsones. This revival reached its climax in 1990 with the theatrical release of their feature film. In these latter-day Jetsons episodes, O'Hanlon came out of retirement to play George Jetson again. He died shortly after the completion of the 1990 feature. Is their saga now complete? Will new animated material continue to appear? Perhaps, but one thing is certain — the Jetsons material that we have seen, we will see again. Text ©2000-04 Donald D. Markstein. Art © Hanna-Barbera.